Just like many would-be-published writers, I am often guilty of that: I’ll come home from my day job, update my blog, look up some agents on the Internet, read a book, watch a movie, eat, make telephone calls, vacuum my living-room and… you get the idea. And then I go to bed without having written a single line of that novel I’m currently trying to finish. But to every problem there is a solution. Thus I have decided to join an awesome challenge called A Round of Words in 80 Days (aka ROW80). Created by Kait Nolan, it is “the writing challenge that knows you have a life”, or “the challenge that champions the marriage of writing and real life.” Unlike NaNoWriMo which runs for only a month, each ROW80 round runs for 80 days and the participating writers have to set themselves writing goals for that time. Each Wednesday and Sunday, we check in and let the others know how we are doing. The idea is to form writing habits that writers will hopefully continue once the challenge is over. 1- I shall try to write the first draft of my new dystopian novel with at least 750 words per day. 2- I shall also attempt to self-edit/revise The Last Queen so that I finally have a final draft for it. We’ll see how that goes…! Round Two started on Monday, April 2nd (so I jump in a little late) and will end on Thursday, June 21st. Post a check-in post every Wednesday and Sunday, in which you share your progress with the other ROW80 participants. 11/04/2012 Post Edit: so I’ve slightly changed the wording of my goals as a few people mentioned that I shouldn’t be using the words “try” and “attempt”. So far I’m doing well with those goals. More update on Sunday! This entry was posted in A Round of Words in 80 Days and tagged A Round of Words in 80 Days, About writing, EM Castellan, Kait Nolan, ROW80, ROW80 goals, The Last Queen. Thanks for stopping by Marie! Wishing you the best for your second week of writing/school/revising/blogging/exercising… I have to say I’m impressed by your goals and organization! Whant an inspiration for me… Have a great week! 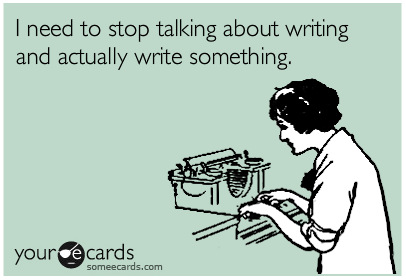 So true about all the stuff we do that is related versus the writing itself. “I shall try to write the first draft of my new dystopian novel with at least 750 words per day.” Good goal to put the focus on writing! My only tweak would be to remove the “try.” I’ve found that planning to hit the goal is a mind trick that works. I then have a focus to carve time to get it done. As Yoda says: No! Try not! Do or do not! There is no try! (or for goal #2: No! Attempt not! Do or attempt not! There is no attempt!) Sorry. Couldn’t resist. Use the SMART method (Specific. Measurable. Attainable. Realistic. Time-sensitive.) Still learning that one myself. Like Shawn said. ;D I’m guilty of being MIA from the social networking and my Blog because I’ve done just what you’re quote pushes us to do — set it aside in favor of writing. It’s tough. There are sooooo many distractions. Sounds like you’ve got some good, realistic goals. Good luck with your ROWing! Great goals (now that you’ve tweaked them a little LOL)! 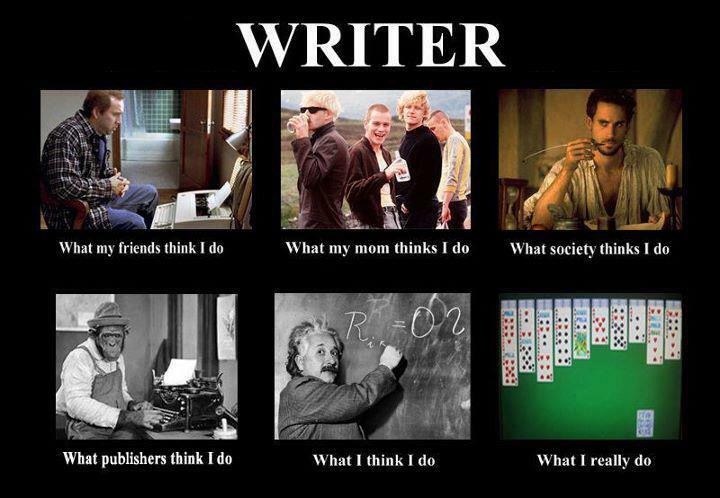 I also love that “What … thinks I do” image. It’s so very true. And it needs to stop being so true! I need to kick the “Solitaire” (read: Diablo 2) habit. Good luck on the remainder of this week! Thanks to all for stopping by and supporting me! I wasn’t expecting so much support when I joined ROW80, I just figured it would be a good way to get myself motivated to write… This is a VERY nice surprise 🙂 Have a great writing day!